Share the post "The Mighty Oaks"
What I saw early this morning was worse than I’d expected when speaking about last night’s storm. I was shocked to see the streams along with the Winnebago River so high. As the morning wore on and going to and from appointments today, I could really see the devastation caused by the wind. I couldn’t believe how many big trees around homes were felled. I hope no one was injured when they came crashing down. 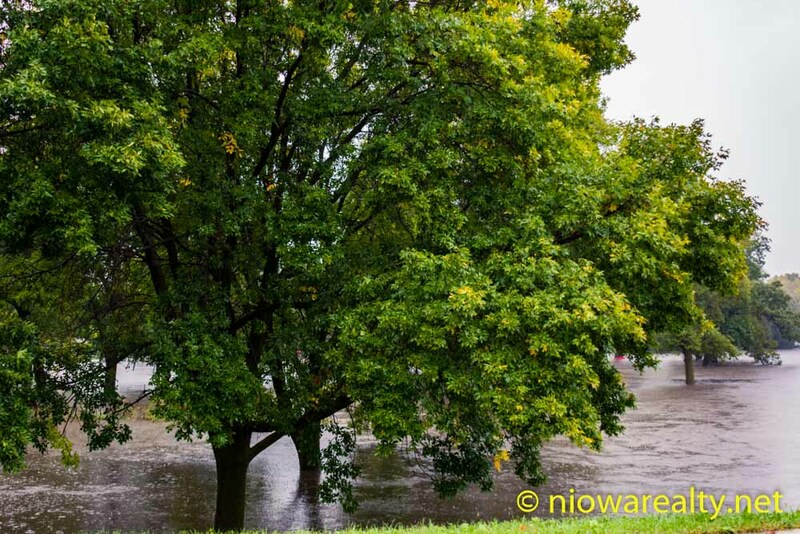 I had my camera with me and took a few photos of the flooding which included one showing East Park under water. While I was visiting with a long time client today about all the damage I shivered and said, “If I didn’t know better, I swear someone must’ve done something really bad to another yesterday that unleashed those winds and rain, because it’s been many years since I’ve experienced such tremendous gusts in Mason City.” He smiled and said, “I pretty certain neither of us can be blamed if that was the case.” We were both very thankful our trees survived that pounding. I still haven’t heard the exact amount of rain we got, but I’m pretty sure it was well over six inches. I heard a number of stories today about water in basements, and no doubt there’ll be wet carpets out in driveways these next days. I mentioned to someone how crazy these weather patterns have become to where one section of our country is in a prolonged drought, while others are getting too much precipitation. I was terribly sad to hear how Greene was flooded overnight. I heard in passing they received over a foot of rain. Now that’s a heck of a lot of rain, not to mention they’re getting all the water from us via the Shell Rock and Winnebago rivers. It was just yesterday I mentioned to someone how the counties downstream from us must have to bear the bigger brunt from the runoff we get. I finally got the go ahead on taking photos at the acreage I have listed in Fertile which is located at 305 N. 1st Street. On my way up there which is only a 20 minute drive, I really got a good look at what so much rain does to cropland and pastures. More than once I noticed beef cattle standing alone the fence lines simply because it was the highest ground away from their water logged pastures. I can imagine what their feet must have felt like. Have you ever walked in sticky mud? I have and it isn’t fun. Just as I was crossing the bridge over the Winnebago River, I noticed the park next to it was also flooded. I made it to the acreage and snapped as many photos I thought necessary and headed back to the office. We’re starting to get interest in it and now with having the interior photos posted, there should be even more. That home and land has been in the same family for over 100 years. The owner’s grandfather had it built. Now that’s quite a legacy to be talked about. The times I used to drive by it in the past, I always thought it to be a handsome homestead. It now needs some cosmetic work but the home is rock solid. Anyone who’s looking for a heated shop with running water, this place offers it. My absolute favorite feature of this acreage is the near five acres of old growth oak trees. While I was there I looked to see if last night’s wind had done any damage and it didn’t. Yes, it was again re-affirmed how storm resistant the mighty oaks can be when put to their test.